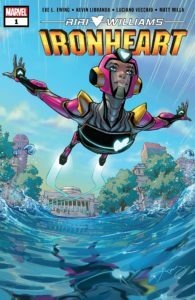 Though she was first introduced nearly four years ago, Ironheart marks the first time our titular heroine has actually headlined her own series. She previously appeared in the pages of Brian Michael Bendis’ Invincible Iron Man in a major role towards the end of that run, but it wasn’t truly her story. After joining the Champions and squaring off against Thanos, of all people, it’s just the right time for Riri to become an undisputed protagonist. Luckily, writer Eve L. Ewing has her work cut out here. Because Riri is still so fresh and new in the broader context of the Marvel Universe, there’s a lot of undeveloped ground to cover with the character. We’ve seen flashes of her personality up to this point — slightly antisocial, kind of a loner — and how they’ve been informed by upbringing marred by personal tragedy, but she’s still in enough of a state of flux that Ewing has an opportunity to truly define who Riri Williams is, and who she’s going to be moving forward. It’s also worth noting that Ewing is currently one of two black women (alongside Shuri’s Nnedi Okorafor) penning ongoing Marvel titles about black female characters, which is a good sign for creator diversity at the company. Things could still be much better, obviously, but having two very different titles like Shuri and Ironheart running concurrently should be considered a win for inclusion. As a first issue, Ewing cleverly writes a one-off caper that could very well be followed upon in later installments (and likely will), but mostly functions as an introduction to this character. Her status quo is set up neatly — she’s an engineering student at M.I.T. who splits her time between tinkering in her own personal lab by day, and flying off around the world as the armored superhero Ironheart. Kevin Libranda and Luciano Vecchio’s art is very good, and though an editorial shakeup has resulted in this issue being delayed a few weeks, you can’t really tell by how it looks. 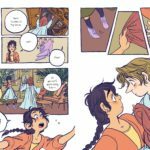 Libranda and Vecchio’s styles are analogous enough that you don’t particularly notice when it’s one or the other; it’s very much the best case scenario of a tricky spot. They each render the actual Ironheart suit appealingly, which I imagine can’t be easy, given how much more detailed and ornate it’s gotten since the original Stark-esque design. Matt Milla also deserves a very special mention for unifying his artists’ work with a dynamic palette of colors — one particularly heavy on the pinks, blacks, and yellows of Riri’s armor — while Clayton Cowles’ letters are reliably good. Ewing’s script can get a bit wordy in spots, but Cowles presents it in a way that’s not intimidating to the eye at first glance. 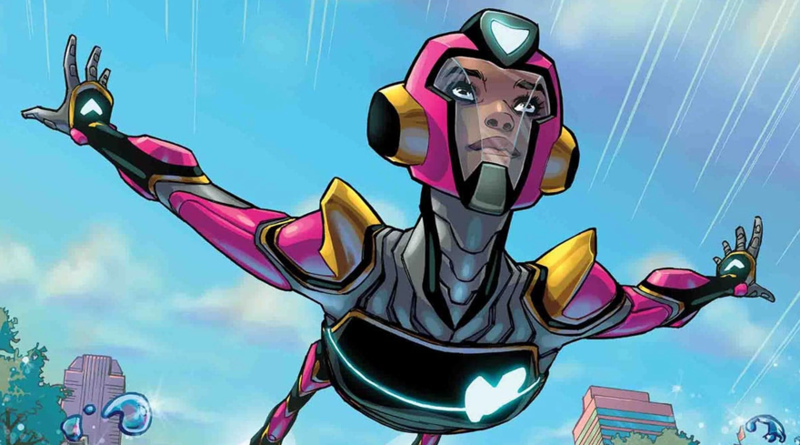 Ironheart #1 shines a light on one of Marvel’s most promising new characters, matched by an equally impressive creative team led by writer Eve L. Ewing.